Drips Nic Spiker has developed an easy to use solution for getting the nicotine levels you want out of the E-liquids you love. Turn any traditional E-liquid from 0mg to your preferred strength with just a few drips. Only for use in Sub-Ohm Devices. Turn any traditional E-liquid from 0mg to your preferred salt nic strength with just a few drips. Only for use in Nic Salt Devices. Whatever your preference. Drips Nic Spiker has developed an easy to use solution for getting the nicotine levels you want out of the E-liquids you love. 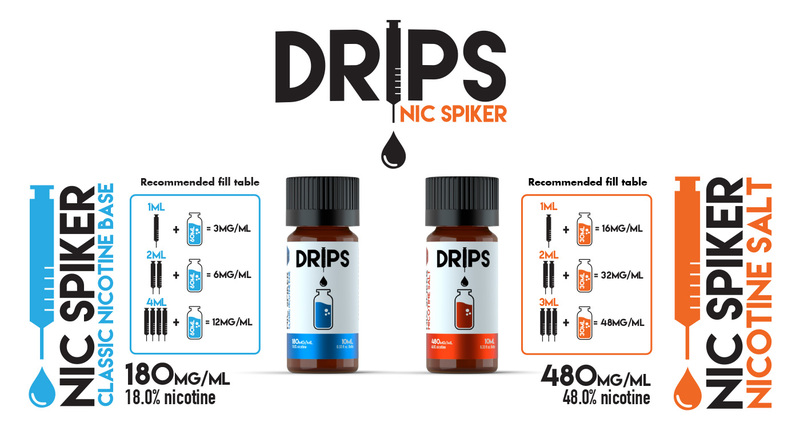 Drips Nic Spiker offers both Classic Nicotine Base for the traditional Juice connoisseur, to our Nicotine Salt Spiker for the Pod lovers. Whatever your fancy just take it for a spin: you won't be disappointed.